For more information, please read or download our RV & Stall reservations policy below and call our office to make your next reservation. 1. 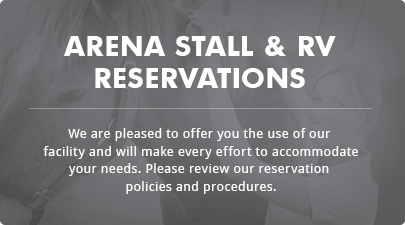 On-line reservations must be made 48 hours in advance prior to the start of your event. Reservations made within 48 hour must be called in. 2. Shavings are not required at the West-Cal Arena but may be purchased from the Arena as needed. No outside shavings will be allowed at the facility. 3. After hour arrivals must be paid in full. At no time will any stalls or RV’s be unlocked without full payment. 4. Check-in time for stalls and RV’s is 3:00PM (early arrival fees may apply). 6. For emergencies, please contact the after hours manager-on-duty listed at the ticket window at the front of the building.